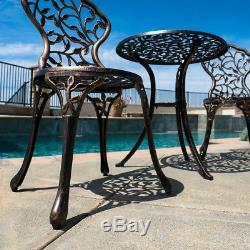 Outdoor Patio Furniture Tulip Design Cast Aluminum Bistro Set in Antique Bronze. Relax outdoors with the 3-Piece Bistro Patio Set. 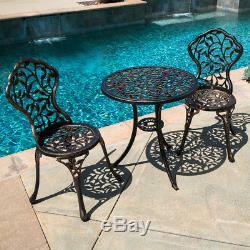 A charming and traditional rose pattern is set into the round table and two chairs to blend with your outdoor ambience. 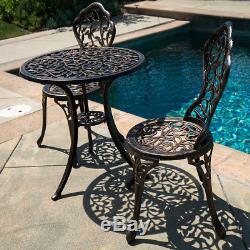 This outdoor bistro patio set is perfect for tea in the garden or patio, or deck. The round table features an aluminum top that add to its elegant design. For added stability and extended durability, the furniture legs are made from cast iron. 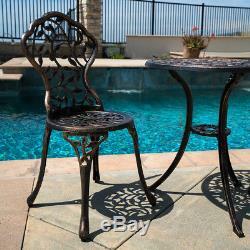 This outdoor bistro patio set will make a perfect addition for patios that need a traditional setting. Perfect for garden, park, deck, porch, backyard or pools. Stable With Wide Leg Positioning. 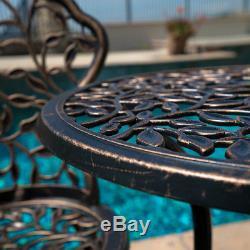 Constructed of durable, weather proof, cast aluminum. Finished in elegant antique bronze. Neutral colors to match any outdoor decor. Ideal for entertaining guests outdoors. Includes One Table And Two Chairs. Assembly Required And Instruction Included. Materials: Cast iron and Cast aluminum. 24"(W) x 26"(H). 15"(W) x 17"(L) x 33-1/2(H). All deliveries are subject to UPS holidays. Who do I contact if I receive a damaged product? If your product is damaged, you may use the contact form provided. We do not offer wholesale pricing. Do you offer any installation services? We do not offer installation services. I received an incomplete order missing parts, manual, etc. Why was my order cancelled? This listing is currently undergoing maintenance, we apologise for any inconvenience caused. 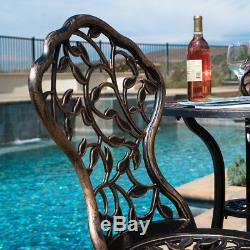 The item "Outdoor Patio Furniture Tulip Design Cast Aluminum Bistro Set in Antique Bronze" is in sale since Tuesday, March 14, 2017.